The ShoFight 20 card scheduled for June 16th at the O’Reilly Family Event Center in Springfield, Missouri is stacked with MMA notables and is shaping up to be like an All-Star event. And, any All-Star event would not be complete without HyeFighters being included. The ShoFight 20 event has 4 HyeFighters scheduled on their card. They Are, Karo Parisyan, Karen Darabedyan, Sevak Magakian and Ara Muradyan, all of whom are close friends as well as training partners at Gokor Chivichyan’s Hayastan MMA Academy. These fights should be very entertaining and good match ups. We will provide more information as it becomes available. 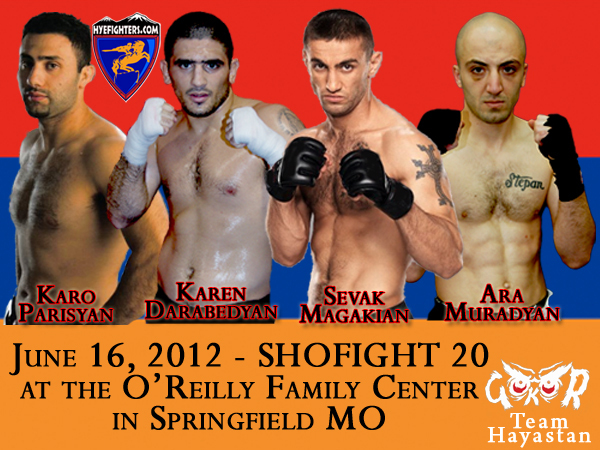 The event will take place in Springfield, Missouri at the ShoFIGHT MMA 20 for tickets go to www.DruryTickets.com, reserve them fast seats are quickly being taken.